An iconic red telephone box with Royal connections has turned up in Royal Deeside. The owner of the mystery phone box can now be unveiled by the Press and Journal as HRH the Duke of Rothesay. Once a familiar sight around the country, the eye-catching kiosk is one of the most well-known British iconic designs – designed by Sir Giles Gilbert Scott and emblazoned with a prominent crown. The traditional phone box was bought by the royal and has since been converted into a library exchange for passing book lovers in need of a good read. The location of the box however had, up until now, been held from the Prince in the hope of surprising him one day when driving past – as an additional 70th birthday present. 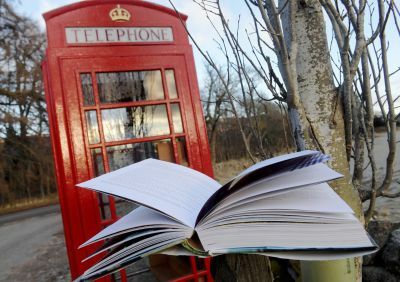 Placed on the site of a former telephone box, the refurbished model can be found on the B976 South Deeside Road close to the A-listed Abergeldie Castle – marking a new chapter for the site which lost its original box during a BT cull. Books have already been placed inside the refitted box in the hope visitors will bring more, taking new volumes away in exchange. Ballater and Crathie Community Council member, Anne Reid, had submitted the plans on behalf of HRH and was under “strict conditions” not to let him find out. She added: “We had hoped that we could have had it in place in time for his birthday, but the planning took slightly longer than anticipated. “My understanding was that he knew that he had bought a telephone box – but he didn’t know where exactly it was going to be located. One condition of the planning, which was granted last month, was that parking spaces for two cars should be added at the adjacent lay-by.